Ordos (è ěr duō sī 鄂尔多斯) is situated in the southwest part of Inner Mongolia Autonomous Region. Ordos city, Hohhot (hū hé hào tè 呼和浩特) city and Baotou (bāo tóu 包头) city in Inner Mongolia constitute the most dynamic area of "Golden Triangle" in Inner Mongolia. "Ordos” is Mongolian which means “numbers of palaces”, and it is also the tomb protection tribal name of Genghis Khan (chéng jí sī hán 成吉思汗). Ordos enjoys a long history. As early as 30,007 years ago, “Hetao People” (hé tào rén 河套人) started to thrive on this vast land and created the phenomenal “Hetao culture”. In the Shang Dynasty 3500 years ago, a significant page in the history of nomadic people was uncovered and a famous culture “Zhukaigou Culture” (zhū kāi gōu wén huà 朱开沟文化) was developed, which marked the evolution of the nomadic population in the north from a primitive state to a civilized one. 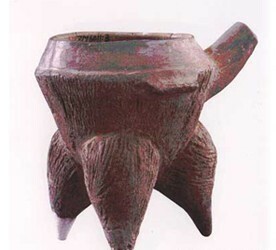 Between 2800 BC and 2300 BC, “Ordos Bronze Culture” flourished, represented by bronze wares decorated by a variety of animal patterns. Entering the mid-15th century, the Ordos tribe responsible for guarding the mausoleum of Genghis Khan marched into Ordos from the Mongolian Plateau. The long history and unique location of Ordos has bred a regional culture with primitive simplicity and profound elegance. 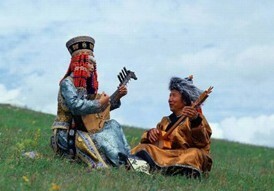 Ordos is home to beautiful songs with melodious and soft long tunes and fresh and brisk short tunes. What is especially popular is its Manhan Tune (mán hàn diào 蛮汉调) widely appreciated in Shanxi, Shanxi and Inner Mongolia, with Senjidema (sēn jí dé mǎ 森吉德玛 a Mongolian song) being a good example. The Zhungeer Qi in our city is also thus nominated as “Home to the Art of Manhan Tune” by the Ministry of Culture. Ordos is also famous for its dancing art. Such shows as “Chopsticks Dance” and “Cup Bowl Dance” are recognized as national art treasures. In addition, Ordos is the area where the Mongolian traditional rituals are preserved most intact, and the worship ritual for Genghis Khan and Ordos wedding ritual have been included in the national list of intangible cultural heritages. Such epic masterpieces as "Origin and Development of Mongolia” and “The Golden History of Mongolia” with profound cultural and historical significance are also born in Ordos. Ordos also took a special role in recent history of national revolution. The “Duguilong” movement (dú guì long yùn dòng 独贵龙运动) broke out here which kindled the “Ordos Storm”. Nowadays Ordos, with its historical foundation and regional features, is walking toward the whole country and the world. Ordos belongs to typical temperate continental climate with clear four seasons and abundant sunshine. The rainfall is infrequent and mainly concentrates on the period between July and September. Spring is the season often blowing sand and dust storm. The Best Time to Go: Summer and autumn are the best seasons to Ordos for the weather is cool and the dust storm is slight. 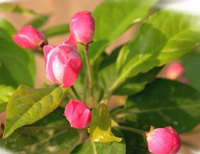 Cashmere, oleaster, malus micromalus are the special products of Ordos. Ordos Plateau boasts a famous type of cashmere goat reared for the production of meat and wool─ ─Ordos White Goats, applauded by the herdsmen as the pearl on the prairie. As the goat is mainly distributed in Sumus (sū mù 苏木) of Ertuoke banner (è tuō kē qí 鄂托克旗), it is referred to as Sumus White Goat for short. Sumus White Goat is classified as one of the twenty finest varieties in china. The 22-28 cm long hair which covers the skin surface of the Sumus White Goat provides good protection for the cashmere, thus its cashmere is known for its long fiber, softness and sheen, and a high ratio of cashmere production from wool, which is praised as “diamond fiber”, "king of cashmere”, "white gold” and “soft gold”. As goats causes serious damages to the pastures, counties all have set limitations on the amount of goats raised, hence the output of cashmere is also limited. As the largest cashmere producer in the world, China produces about 8000—10000 tons of cashmere hair every year, which takes up 3/4 of the total output of the world. The annual output of Inner Mongolia is 5342 tons, which amounts to half of the total output of China, and its quality is the highest. The majestic mausoleum is made up of six halls and corridors, and the five-meter-tall (16-foot-tall) statue of Genghis Khan stands at the entrance to the mausoleum. In the seventeenth day of the third lunar month, celebrations will be held to commemorate this great leader, and this day is the most ceremonious and joyous day in the mausoleum. It is a popular tourist site located in Dalad Banner (dá lā tè qí 达拉特旗). In the sunny days in summer, if you slide down the slope, you will hear the sand make a noise like monks praying or a plane flying by, a natural and as yet inexplicable phenomenon. 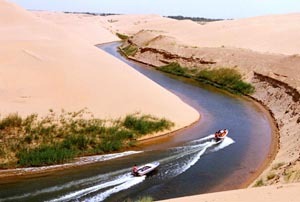 Apart from sand sliding, one can also ride horses and camels, or ride on sand-sliding boats. 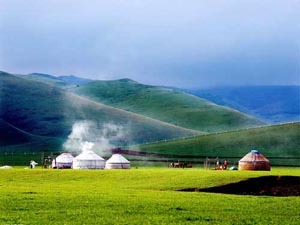 The park is located in the Kubuqi Desert, Wulan County (wū lán xiāng zhèn 乌兰乡镇), Dalad Banner. Engbei means safe and propitious in Mongolian. 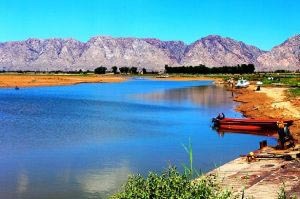 On a 3.5 kilometer stretch of river which meanders through the desert with sand dunes on both sides, you may sail a yacht or row a boat to enter the desert center. How to Get there: Take a bus at the Baotou East Station Square. 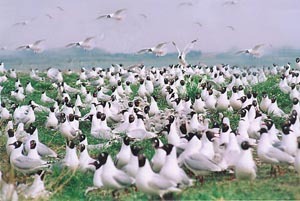 The relict gull nature reserve is located at the junction of the Bojianghai town (bó jiāng hǎi zhèn 泊江海镇) in Dongsheng district (dōng shèng qū 东胜区) and Sumuergasumu (sū bù ěr gǎ sū mù 苏布尔嘎苏木) in Yijinghuoluo banner (yī jīn huò luò qí 伊金霍洛旗). 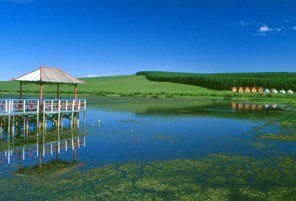 it is a national natural reserve, a world conservation wetland and a state 3-A tourist area. Because of the typical ecological system of plateau desert and semi-desert wetland, there are large stretch of wetland, sands, grassland, and hills as well as lakes and islands. The water surface area is 10.2 square kilometers, with an average depth of 3.5 meters. More than eighty species of birds live here such as relict gulls, eastern cravens and white Swans. The core visiting area is the bird island. Tourists can see the overall course of relict’s breeding during the breeding time. As a rare and precious bird, the relict gulls are under state-first-class protection. According to textual researches by ornithologists, more than three quarters of the gulls breed here. And every year in spring and autumn (early March to May, early October to November), there will be as many as ten thousand white swans chasing and playing with each other on the lake. Another scenic spot is the ‘long life island’. You will have a bird view of the bojianghaizi, the grassland around and the stretch of wetland. It is said that people traveling on the island will have longer and healthier life. Location: At the junction of the Bojianghai town in Dongsheng district and Sumuergasumu in Yijinghuoluo banner. The Seven-star Lake Ecological Tourist Attraction lies in the Kubuqi Desert (kù bù qí shā mò 库布其沙漠) in Hangjin Banne (háng jǐng qí 杭锦旗), which is a tourist attraction for holiday, featuring mainly on its sand resources and lakes in sand, with its construction invested by Elion Group. It covers an area of 8.89 km2, with the water coverage 1.15 km2, reed marsh land 0.1 km2 and grassland 3.8 km2. It got named “seven-star” as there are seven lakes in the form of the Big Dipper. Thus there comes the saying “Big Dipper in the Sky and Seven-star Lake on the Earth”. Location: In the Kubuqi Desert in Hangjin Banne. 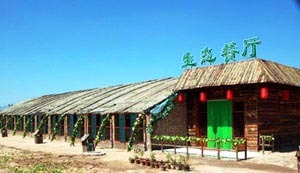 Jiuchenggong Ecology Garden, an AA national tourist attraction, is located in the Hantai town (hǎn tái zhèn 罕台镇) which is about 20 km away from the downtown, covering an area of 1800 mu. It is a key ecological construction project, as well as the scientific research base for sea buckthorn. It includes 6 zones, which are villa, man-made lake, water park, growing area, culture zone and dining zone. How to Get there: Take the bus No. 21 at the Sanjiao Park (sān jiǎo gōng yuán 三角公园) and get off at the Yuxihuilong Ecology Garden (yù xī lóng shēng tài yuán 玉溪汇龙生态园) stop. Ordos Cultural Tourist Village, covering an area of 28000 mu, is the earliest explored tourist attraction in Etuoke front banner (è tuō kē qián qí 鄂托克前旗). It is located in the Ordos Grassland, where Inner Mongolia and Ningxia meet, with the beautiful Ningxia plain land to its west and the ancient Ordos plateau to the east. It gathers 81 kinds of Sulde altars with different styles. In it there is the grand Ordos Gate of both Mongolian and Han features, with its height 12.06 m, the size of which is taken the auspicious number 9 as the base. There is also the biggest Mongolian yurt in western Ordos, 36 m in diameter, which was named Bayintala Palace (bā yīn tǎ lā gōng 巴音塔拉宫), meaning rich and far-flung grassland. Here you can enjoy the Ordos Mongolian songs and dances as well as the Ordos Wedding ceremony. 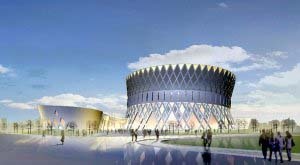 The village includes cultural sites, Ordos customs village and Minority sport, culture and entertainment zone. Location: In Etuoke front banner. How to Get there: Take a coach to Etuoke front banner at the Ordos city, and get off at the Dahanxinggong (dà hàn xíng gōng 大汉行宫), then you can get there with a few minutes’ walk. In the Yellow River Canyon where the east of Zhunge’er banner (zhǔn gě ěr qí 准格尔旗) and Shanxi province (shǎn xī shěng 山西省) meet there are many rifles and shoals. The place is the most precipitous area along the Yellow River, which became a must for the army of that time. It is also of great interest to cross the river by a sheepskin raft. 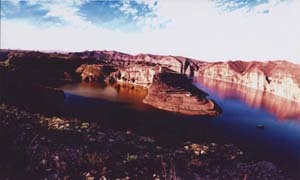 The main sites here include the Yellow River Three Gorges, reservoir, ancient city, fishing spot and beaches etc. 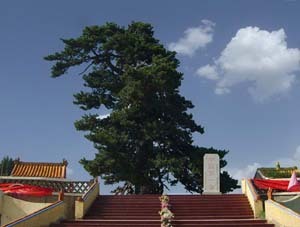 In the east Ordos plateau and inside Zhunge’er banner there is an ancient pine which is named “Pine King”. It came to its life naturally in 1089 and has a history of over 900 years. It is a live fossil in the Ordos plateau, 25m in height and 1.34 in pectoral diameter. It provides very valuable materials for the study of forest, vegetation, climate, hydrology and geology in Ordos. 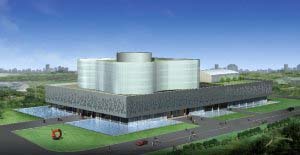 Ordos Museum, to be invested with 502.58 million yuan, is located in Kangbashi New District (kāng bā shí xīn qū 康巴什新区), to the northwest of culture square. It is to cover an total area of 2.78 hectares, 40 m in height, total construction area 41227㎡, underground construction area 8175㎡, above-ground area 33052㎡, one floor under ground and 5 floors above ground. It is designed like a lightening stone, the first steel and heterotypic structure building in our city. Its outer curtain wall system is very irregular and complicated, enjoying a working life of 100 years. It is used by the culture bureau and Ordos Museum. Ordos National Theatre is invested with 361.6 million yuan, 2.27 hectares in total land coverage and 38700 m2 in construction area, one floor above ground and 3 floors under ground, with its height 44.4 m. It consists of a bigger rounded building (the theatre), a smaller rounded building (the music hall) as well as the building connecting them. 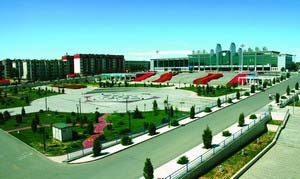 The idea of it comes from two Mongolian caps of both men and women, and it is of frame steel concrete structure, with a working life of 50 years, used by Ordos Theatre. 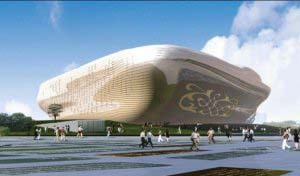 Ordos Culture and Art Center is constructed with 317.82 million yuan, one floor above ground and 5 floors under ground, with its total area 2.25 hectare, and construction area 42000 m2. It is a cultural center for local residents to entertain in their free time. It is designed under the concept of "Round Sky & Square Earth”. As a high building in frame structure, its working life is 50 years. Ordos News Building is located in Kangbashi New District, covering an area of 1.66 hectares (100 hectares is 1 k㎡), with its total area coverage 44200㎡. Its total height is 46.1m, with single underground floor and eight above-ground floors, enjoying 50-year working life. Its building density is 47.4%, floor area ratio 2.18% and green coverage rate 27.4%. 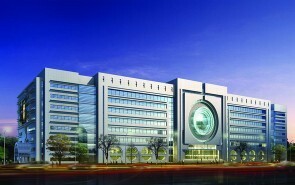 The News Building, designed under the concept of “looking world in news”, includes Ordos Daily, Ordos TV, Ordos Broadcast and professional recording studios, etc. , which has been ranked in the forefront in China. Ordos is about 280 km from Hohhot and about 580 km from Yinchuan The national highway No. 210 runs through the east to the west and No. 109 runs through the north to the south. The airport is about 48 km from the Dongsheng District; there are flight to and from Xi'an (xī ān 西安), Beijing, Shanghai (shàng hǎi 上海) and Chengdu (chéng dū 成都). And three railway lines, Jing-bao (京包 jīng bāo) (Beijing - Baotou), Bao-lan (bāo lán 包兰) (Baotou - Lanzhou), Bao-Xi (bāo xī 包西) (Baotou – Xi’an) run across the city. The Ordos Airport is 38 kilometers (24 miles) from the Dongsheng District, adjacent to the Mausoleum of Genghis Khan. The airport has recently opened flight to Beijing once a day with one hour's ride. Ordos is 240 kilometers (149 miles) from Hohhot and no more than three hours' ride to Baotou by train. Every year in the August, the Nadam (ná dá mù 那达慕) Fair is held in the prairie resorts of Ordos.